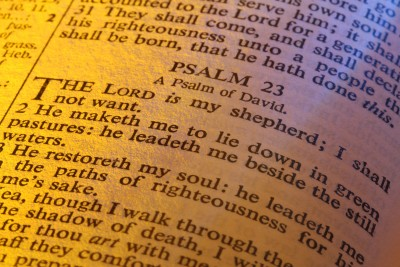 Can we relate to the 23rd Psalm today? What principles can we apply to our lives? What help is there to be found in the 23rd Psalm for believers in the 21st Century? The Psalms remind me of the word “songs.” They were originally written as musical expressions of worshiping God. They reflect on His goodness, His holiness, His power, His deliverance, His provisions and the salvation that is found only in Him. David wrote most of the Psalms but not all of them. In most Bible’s you can see who the author was. David was also an extraordinarily gifted musician and King Saul loved to hear David play. It was always soothing to him in his often troubled spirit. Worship music has a way of reaching deep into the depths of the believer’s soul and lift it out of the darkest of nights. A Psalm is a praise song and is a poetic work of art. We are focusing on one of the most widely recognize and beloved…the 23rd Psalm, often called the Shepherd’s Psalm. Today we know that Jesus Christ is the Good Shepherd. He watches over His little flock, the church. He is the Head of the Church and its provider and protector, just as a real shepherd was to his sheepfold. David was a shepherd before he was a king and so he could see the symbolism of God’s shepherding His people when he wrote Psalm 23. I offer this line-by-line exposition of the 23rd Psalm so that we can look to see exactly what David is telling us under the inspiration of the Holy Spirit. The symbolism of the 23rd Psalm has much more meaning to us today than we might imagine that it did in David’s day, which was an agrarian society. God is our Shepherd and like a Good Shepherd, He will provide for His own for every need we will ever have (Philippians 4:19). It does not mean that He will provide for every thing we want, but for everything that we need. He is a faithful Shepherd that provides for His sheep (Matthew 6:33). 2 He makes me to lie down in green pastures; He leads me beside the still waters. The Lord is my Shepherd. What more should I want? Here is an interesting line. We often get so busy in our lives that we don’t have the sense to take our rest in Him, so He makes me to lie down. Sheep are not very smart. They have to be forced to rest. Sounds familiar to me. Sheep also frequently feed until there is bare ground and stubble, but the Good Shepherd makes us lie down in green pastures. In the pastures we can get fed and we must feed on Him for He is the Word of God (John 1) and we can dine daily on the Bread of Life. Sheep are also afraid of moving water and even if they are dying of thirst, they will not go near a running brook or creek…but they love the still waters. They can drink freely from Him Who is the Living Water. He leads us, you might notice, because we are all like sheep and we go astray, and we can’t always find the still waters. More often we end up in troubled waters, well over our heads. 3 He restores my soul; He leads me in the paths of righteousness For His name’s sake. When we grow weary and fainthearted with the troubles of life, He restores and refreshes us. This “restoring” is also a restoration from eternal death to eternal life. Sheep are not always aware of where they are going. In fact, sheep have been known to walk right off a cliff and so the Good Shepherd leads us in the paths and His path leads to His righteousness. Not for our sake but for His glory and for His name’s sake. One of the chief purposes of mankind is to glorify God and to glorify God for His name’s sake. God will not share His glory with another. Why should He? He is worthy of all glory. Sheep are susceptible to predators. Satan is said to be like a roaring lion who roams around seeking whom he might devour but He is walking in the shadows with us. Satan stalks and crouches down low so as to spring on unsuspecting prey. Our daily walk with God is fraught with trials, troubles, and risks, but He is with us throughout our life. That is why we don’t have to fear evil. It is because He is with us that we should not fear. Sheep without a shepherd can easily be frightened and startled to death and die of a heart attack. Why could a rod help the shepherd? It was because the rod was used to protect against predators, to defend the sheep in case of attack, to guide the sheep, and to keep them in the right path and not wander from it. The rod was not only useful for a weapon but symbolizes authority over the sheep. The staff on the other hand had a bend in it. This bend was fitted perfectly for bringing in the stray sheep by their necks. It was so perfectly shaped that it would never choke the sheep but it was narrow enough to be able to bring the sheep back into the fold in a gentle, loving, yet firm way. If sheep end up on their backs, they could not right themselves and would die of starvation on their backs. That is why it was comforting to the sheep to have the shepherd near them. The staff kept them in the fold, kept them on their feet, kept them free from harm and kept them free from fear. The rod and staff, even from the time of the ancient Egyptians, have been symbols of royalty. God is preparing a place at His table for us. This reminds me of the Great Marriage Supper of the Lamb of God when we will dine with our Lord on that Great Day of the Wedding Feast. John wrote that “Blessed are those who are invited to the wedding supper of the Lamb! '” And he added, “These are the true words of God“ (Revelation 19:9). Remember that Jesus said to the disciples before He left that “I go and prepare a place for you, I will come back and take you to be with me that you also may be where I am” (John 14:3). Jesus said, “Blessed is the man who will eat at the feast in the kingdom of God“ (Luke 14:15). The anointing of oil is a symbol of the Holy Spirit and it also pictured the anointing of the kings and priests which believers are destined to be someday (Revelation 5:10). Finally, the cup that runs over is symbolic of Eastern hospitality. When a guest was welcome to stay, they intentionally overflowed the cup so that the guest realized that they were welcome to all that the hosts had and could stay as long as they wanted. This is indicative of eternal life in Christ. We will abide with Him for all eternity. 6 Surely goodness and mercy shall follow me. All the days of my life; And I will dwell in the house of the Lord Forever. With a sense of assuredness, David understood that mercy and goodness would follow him. Not just while he was king, but all the days of his life. God has said that He is the God of the living and not of the dead (Luke 20:38), thus he knew that he would dwell in the house of the Lord Forever. This is an Old Testament revelation of what is to come for those who are His. It is a prophecy that will be fulfilled by Christ at the physical death of all believers. We will dwell in the house of the Lord, which is the Kingdom of God, forever and without end. That is nothing less than eternal life (John 3:16). What comfort it is to know that our Lord will provide for our every need (v 1), that He will provide the Bread of Life and Well of Water that never runs dry (v 2), that He will lead us down the right path for His glory’s sake and restore us at death to eternal life (v 3), that His staff and rod will protect us, guided us, and preserved us (v 4), that even now, He is preparing a place for us and will come again someday because we have the Holy Spirit (v 5), and no good thing will be withheld from us and we will dwell with Him for ages without end in the Kingdom of God (v 6). This short little Psalm is packed with powerful promises, provisions, and purpose. The Lord is my Shepherd. What more should I want? Here is another Bible study by Pastor Jack, have you read it? What is Sanctification? Thank-you Pastor Jack, well said! I so enjoy reading what God has given you about His word. I always loved that psalm, its sad that its usually only read at funerals, because it has soo much to offer about living, living His life, the life He gave us! There is so much comfort in it, and you can see how much He truly loves us through the complete care it talks about. Thanks again for your obedience to Him in your service, God Bless. Thank you so much Paul. When I began to study this Psalm closer, it just amazed me at how amazing God is as our Great Shepherd. Thank you so much sir. this article really helped me to understand Psalms 23 . i have a new out look on the meaning of this . I too didn’t really know the 23rd Psalm like I thought I did but when I started seeing the symbolism of it, my eyes went wide open. What a great and love Shepherd we serve, don’t we. Thank you for your most kind words. Thank you so kindly Linda. What gracious words you wrote. I loved this Psalm and gave it as a Weds Night Bible Study at the nursing home and they loved it. Isn’t our God and awesome God?! I love this article Jack! Your breadth of knowledge is helping many, including myself, to understand things of the Bible more clearly. I truly have been blessed by this article because I always thought of this as a “funeral” Psalm. It is far from it. It is a “Living” Psalm for all of us. Thank you brother; job well done! Today, I have understood PSALMS 23 better than ever before.David resonating his experience as a shepherd likening it to the Lord and his people is a great piece of educative scripture in the form of art. Thank you Jack. I have understood Psalms 23 much better today than ever before. What a very befitting comparison derived from his experience as a shepherd to God and his people. Well illustrated Jack and thank you very much. Thank you Alfred for your very kind words. I can only say that the Holy Spirit has revealed what I could not on my own and so all glory and honor and praise belong to our God and to Him alone. Agree with Linda above (Feb. 3, 2013) You did a superb job at explaining Psalms 23, Pastor Jack! Thanks for this helpful article on a great psalm. We had a sermon on this in our church a few weeks ago and the preacher caused a little controversy with his take on who the enemies were in verse 5. Just wondered what you would say on this point? Great question Mr. Harris. Thank you sir for your comment and question. I believe that our enemies are the Devil himself and his dominions (fallen angels or demons). We also have worldly enemies of the cross who attack the divinity of Jesus. I am not sure exactly who the enemies of David were but I know that his enemies were Saul and his troops who were trying to kill him to keep Saul as the king. Is this what your pastor said sir? Well, not quite. I have always thought that given that this psalm is about God’s gracious provision and the security we have in being His sheep, that the enemies would be, as you suggest, Satan and his evil forces. But this does raise an interesting thought of whether we could be able to be entirely comfortable with the enemy “crouching near”. And, at the wedding feast of the Lamb, surely Satan will have been banished and no longer a threat. Our preacher said that the enemies which might be present even though bound and defeated could be our fears, anxieties etc. which in this life can destroy our peace. I thought this was an interesting take which actually our pastor (not the preacher) did not agree with. Well, I think maybe we should just rejoice that whatever may be the truth here, we shall be safe in our Lord Jesus Christ. Thank you for your comments. With every blessing. Well said Mr. Harris. I see your point and it is well taken. Today we can only see thru the glass darkly and I love your conclusion that we should simply rejoice that whatever may be the truth…we shall be safe in our Lord Jesus Christ. Amen to that sir! Outstanding. You are spot on the mark Mr. Harris. Your words are a blessing to me and I thank God for you sir that you have a hunger and thirst for the knowledge of God. THANKS SO MUCH for referring me to this article with Scriptures, Pastor Jack! (From your article on The Beatitudes?) Although my sister in Christ, Imelda, ‘condensed’ the meaning of Psalm 23, I truly appreciated this article more so!! Actually, Pastor Jack, this is my 2nd. time commenting (from February 9, 2013.) While reading again, it DID strike me as being familiar. LOL! Then as I read all the comments and saw my comment, aha~! Hee-Hee! ALL PRAISES, GLORY AND HONOR BE UNTO OUR FATHER GOD, HIS SON, JESUS, HIS HOLY SPIRIT!!! Oodles of God’s blessings, Pastor Jack! What is most amazing is that God can use a broken, empty vessel that like Gideon’s clay pots were broken and filled with light to win a great victory by a very small force….I see the analogy. The broken clay vessels would otherwise be rubbish so we must realize that God receives all glory for all we do. I do think its interesting and I did check out the icr article (which website is theologically rock solid…me? Not sure). Thanks for your encouragement sister. It has been a hard week. Another church discipline issue that is quite messy, I start another 7 week intensive at Moody Seminary, I have to work all week, and the church I pastor at needs much counseling…and so I am that broken vessel that is useless without His filling me up! Isn’t our God an awesome God? I stand amazed again and His power and timing …but what is time to God!?. YES, OUR FATHER GOD IS AWESOME INDEED!!! I like that analogy of Gideon’s broken clay pots, too! You know, Pastor Jack, with all you have to do (Whew~! ), I can ‘hear’ the peace and joy within your heart. I try to live each day according to God’s Will, God’s Plan, and God’s perfect Timing. That’s what gives us ‘peace & joy’ through His Son’s, Jesus, Holy Spirit! Right, Brother?